Sunday is a day when many people (including myself) love to have a slow, relaxing (lazy) day... especially come winter time. Now Adelaide's winters aren't that bad. There's no snow. No blizzards. Not even a half decent frost. But last weekend was a challenge for our family. Up and out the door by 8am to go grocery shopping. On a Sunday. For those that don't know, Adelaide's shopping regulations mean that shops generally open after 11am. But then again, we weren't going to a normal shop. It's the Gepps Cross Treasure Market... about 11km north of the city, in the Wallis Mainline Drive-In Theatre. Yes - that's right, there are such things as Drive-In Theatres still around - though this is the only one still operating in Adelaide. T-chan's Japanese friends had for some time been telling T-chan about the wonders of Gepps Cross Markets... and for a long time we'd been nodding our heads (somewhat patronizingly) saying yes, doesn't it sounds wonderful. Fresh vegetables and so cheap. It must be fantastic, I'm sure. But still, we pretty well persisted with the whole buying at the SUPERmarket. It was, after all, super. Then T-chan (who is a notorious late waker) decided one week to try it out. And, when she came back it was like she'd joined a cult. It is cheap, and is good value! Why have we shopped at supermarkets all this time?!?!?! Now the Gepps Cross Treasure Markets opens at 7am (the sellers get there from 5am, even in winter)... and by about 8am you can still get a park (try across Pt Wakefield Rd, at the auto sellers). The sellers are a combination of growers and retailers looking for an extra market outlet. And yes - it's at least 50% cheaper than supermarkets on a lot of stuff. And yes - I'd say it was better value than Adelaide's Central Market which is so very popular, and which I posted about recently. By the way - you often see a line up of cars up to 200m long waiting to get in to the site around 10-11 am... the dis-advantage of an late morning arrival. There are lots of stalls - and I mean LOTS. I'd estimate at least 50 - 70 different food stalls - and that's just the fruit and veg! Now for buyers, it costs $1.50 per person to enter (hmm - that seems a little strange to me... but still you make that up pretty quickly). The interesting thing is working out where to buy from - there's so many sellers that finding out where to buy... but that only takes a few times to work out. Now the upside is the variety and competition that drives down prices. The downside is that the markets are a whole lot less regulated. That also means that quality can be hit and miss. Now I would have assumed that a produce market would also mean that the produce is grown locally. Wrong. There's every chance that you'll find cheap transported or dare I mention it, imported, fruit and veg here, so be aware. As an example, we found a lot of rock melons for sale, very cheap. In the middle of winter? In Adelaide? I'm pretty sure that they've either come from up north (in Queensland) or even further up north.... Still there were a lot of citrus and apples around, and I'm reasonably confident in them... I think. And then there's a different sort of produce... egss. Now free range eggs in the super market normally cost around $5+ for a dozen. How about $5 for 30 free range eggs. That's not too bad a bargain... is it? Of course, the whole weight of responsibility is on you as a buyer to be happy that you believe the seller's claims... and I suspect that you've got next to no chance of getting a refund if you find the quality's not good (this is strictly a cash enonomy here). Indeed, when I knew this market before, it went by the name of 'trash and treasure market' - an interesting way of describing a flea market (which is itself an lovely english term). And yes, there's still an element of that in the Gepps Cross markets today... and you will find both semi-commercial (imported?) goods and also the more home-sourced goods at this end of the market. The sort of area that may not want to be photographed (for good reason). Still, I have to admit that part of me wants to argue the point... something along the lines that it's a free world, and about god-given rights to blog (and hence photograph) about whatever I want... etc etc blah blah blehhhhhh. At the end of the day - it's private property, and if they wanna miss out on free advertising - who am I to stand in their way? As for us - we still do a bit of shopping at the supermarket (as we're habitual impulse cookers - eating what we want, when we want - which tends to make us look for ingredients at least 2-4 times a week). But it's starting to become part of our life. Well - I posted last week about the difficulties for air travel in Australia due to the volcanic ash from Chile... well, as it turns out, my foiled trip to Melbourne was re-scheduled to last monday... and everything looked set for a good trip. I arrived in Melbourne early, and had a productive day - only to hear around 6pm , that flights to Adelaide were being cancelled again due to volcanic ash. Thanks Qantas and the Bureau of Meteorology for warning us!... And yes - it turned out my return to Adelaide on Tuesday evening was cancelled... and the situation was looking grim for Wednesday. Actually, it wasn't only Adelaide, by Tuesday Adelaide, Melbourne, Canberra and Sydney were all cancelled. Faced with the prospect of an indeterminate delay in Melbourne, myself and my boss decided to take drastic measures. To drive back from Melbourne to Adelaide... a small 750 km drive away. Now, as it turns out we most probably could have returned to Adelaide around 8pm today (only 19 hours later), but we didn't know that when embarked on our mini-adventure. Still, it was an adventure, and whilst I complain about Qantas for their lack of warning, they were reasonably good. I heard that the disruption to Qantas on monday cost about 21million alone - though that wasn't dampening their profit estimates that much. Despite the annoyance of driving home... I have to say that I was very happy to be sleeping in my own bed on Tuesday night. Whilst I might need to go to Melbourne again in the near future - this time I'll be keeping an extra keen eye on the ash cloud (which apparently has gone around the globe twice already). Third time, they say, is a charm.... wish me luck for the third trip! Well winter is essentially here, and even though there are a few autumnal leaves clinging willfully to the branches, there is an inevitability that the days will continue to get shorter, and the nights colder. And it's in this environment that as a parent, you need to make the most of clear, warm-ish weekend days. For L-kun, that meant getting out and about. And that meant getting on his bike and riding to the park on his new bike. And what a cheeky day it was... L-kun is getting to be quite the character. He's quite the cheeky one. And he's definitely more physically active now... enjoying sporty stuff more (which he didn't before). Of course, for him those things mean largely running, jumping, falling, throwing, yelling and laughing. Sometimes a bit more falling than is proper, but it's all part of the growing up process. Still, it's always fun - no matter what is going on. And if mum and dad are playing too, then that's just about perfect. He loves racing his parents, and he's got a lot more energy than either of us. And it's a good thing the ground is nice and soft...actually, it was nice that during the games at the park, L-kun played baseball with a couple of other children (quite a bit older). He most probably hasn't had as much opportunity to play with "Aussie" children as he hasn't been to childcare. He's always had plenty of Aussie-Japanese children to play with. At this age, I'm not sure that children discriminate. Children will be children - we learn to discriminate after a few more years of conditioning from the outside world. But, all days come to an end, and as it's now officially winter, the late afternoon air does get nippy... even if it's a lot warmer here than in many parts of the world. So the family returns home, after a really excellent afternoon out... after all, you gotta make the most of the opportunities given to you. We recently celebrated the 3rd birthday of one of our friends children, let's call him K-kun... one of L-kun's favourite play-mates. It was a nice get-together with a few fellow Aussie-Japanese families - and thankfully a good Autumn day for a backyard BBQ. K-kun's a great lad, and our sons always get along well; even though they're almost 1 year apart. Now what do Aussie-Japanese families do to celebrate birthdays. Well, pretty well whatever they want. And K-kun's family (C and Y) had gone to a lot of effort to make a few piñata. And given that K-kun's favourite character was Thomas the Tank Engine, it was a little odd to see a giant Thomas face adorning the first piñata. And another of K-kun's friends, S-kun (we say him as a tiger a little while back) was getting into the spirit of it all. Although there was plenty of fun to be had with the food. Two of K-kun's girlfriends, H-chan and L-chan were happy to let boys be boys. Lots of running around and showing off. Things don't change that much, do they. Having birthday's can be hard work however... and sometimes you just gotta take a quick 5 to gather your thoughts. Then it was time....Cake! Y-chan made a beautiful train cake - as trains are about the bestest thing in the whole world for a boy, just ask K-kun. And K-kun did an excellent job with the candles - despite that they'd increased in number by 50% since last year. Now that's what you call inflation. Meanwhile S-kun played a fan-fare! Happy Birthday K-kun, and well done parents for a wonderful party, and thanks C and Y for a wonderful day. Actually, these sorts of events are always a great opportunity for the group of Aussie-Japanese families to get together, and it's always a great time. We may belong to a relatively small community here in Adelaide, but it's a close group, and one much appreciated by parents and of course, especially the children. Well today is the Queen's Birthday here in Australia (well most of Australia - except Western Australia).... though it's not actually the birthday of Queen Elizabeth II, which is on the 21st of April. Instead this is our "Monarch's birthday", and is therefore re-cycled on the same day each year, the second Monday of June. It may be a little surprising for non-Commonwealth countries to consider that the Queen of England remains Australia's official head of state (though some argue this is really the Governor General as the Queen's representative). Either way, this is largely a constitutional aesthetic legacy rather than a meaningful title. That's not to say we aren't influenced every day by the English laws, customs, morality, sensibilities and of course pomp... it's just that QEII remains a distant figurehead for most Australians, as she does in Antigua/Barbuda, Bahamas, Barbados, Belize, Canada, Grenada, Jamaica, New Zealand, Papua New Guinea, St Kitts & Nevis, St Lucia, St Vincent and the Grenadines, Solomon Islands, Tuvalu and not forgetting of course, the United Kingdom. It is however, always a good thing to give thanks to any one responsible for you getting a day off work. By the way, she's 85 this year...and still going strong. So Happy Non-Birthday Liz... I'll down a drink for you later on. Well, it's been just over three months or so since the fateful events of March 11, 2011. The earthquake. The tsunami. The nuclear disaster. Well, as expected, the situation in Japan has largely left the media perspective, and as a result it's a little difficult to know what the current situation is these days (sitting outside of Japan). The earthquake, Magnitude 9.0, struck at 14:46 Japanese Standard Time about 130km from the major city of Sendai, at a depth of 32 km below ground. The ensuing initial tsunami struck the mainland somewhere between 10 and 30 minutes afterwards, with the vision of the inundation of Sendai Airport occurring at 15:55 (over an hour later). The initial wave was not the most powerful to hit. The height of the wave was initially estimated as 10m, however, in some locations was as high as 38m - with even a 2+m tsunami hitting Chiba prefecture near Tokyo. The tsunami(s) inundated approximately 470 km2, depositing some 23 million tonnes of debris in the main three effected prefectures. The death toll of the March 11th earthquake and tsunami is 15,413 confirmed deaths, and an extra 8,069 people reported missing (as of 12/6/2011). As of the 14th of March, some 468,000+ people were displaced into shelters, that number has now dropped to just over 90,000 people remaining in shelters. The nuclear disaster at the Fukushima Daiichi Reactors were classified as a Level 7 nuclear accident on April 11th, a month after the initial incident...and it wasn't until May 20th that it was officially recognized that a meltdown of Reactor 1 had in fact occured, and indeed that the reactor chamber has been breached. This reactor is continuing to leak large volumes of highly radioactive water into the plant. It is speculated that similar situations may exist in the other reactors. Japanese power companies have yet to recovery electricity production to meet expected demand over summer, and have been suggesting that a further 15% reduction in power use will need to be achieved to avoid the rolling blackouts which occurred early after the disaster. It is quite likely that the total radiation emitted from these reactors will exceed Chernobyl (if it hasn't already... ). The reality is that Japan is still very much reeling from the the effects of the triple disaster, and it's good to remember that the challenges facing the country are still very much real. Whilst the world's media attention may have moved on to more important things, the reality is that beyond the stoic patience of the Japanese lies a very wounded country facing what has been called the most expensive natural disaster in the world. Adelaide has a reasonable asian community, although this is the most un-asian city of all of Australia, with only about 6-7% of the population identifying themselves as asian in the 2006 census. Approximately, 60,000 people identified their parents from coming from an asian country. As such, it's doubly important that Adelaide have a focal centre for asian culture, and Chinatown and the annual OzAsia Festival are two important parts of that. There are two entrances, straddling Moonta Street, and Chinatown covers a couple of blocks of asian grocery shops, restaurants/food courts, and assorted businesses with an asian feel. Gouger Street, apart form having a number of great restaurants, also has a good number of Chinese/Asian restaurants (we might review a few later on). (a) "Any person who when asked to do so by an officer fails to write out at dictation and sign in the presence of the officer a passage of fifty words in length in an European language directed by the officer"
(c) "any idiot or insane person"
(d) "any person suffering from an infectious or contagious disease of a loathsome or dangerous character"
(e) "any person who has within three years been convicted of an offence"
(f) "any prostitute or person living on the prostitution of others"
(g) "any persons under a contract or agreement to perform manual labour within the Commonwealth", where this exempted Pacific Islanders amongst a select set of people. The reality is that the immigration officer could ask the prospective immigrant to dictate in any of the European languages, almost guaranteeing the ability to exclude unwanted immigrants (non-Europeans) from entering Australia. Thankfully, the dictation test was removed - but it took until 1958 to do so!... and another 16 years before the White Australia Policy was gone for good. So, apparently we weren't racist, just linguistically biased (as well as discriminating against the lowly, the idiots, diseased (or loathsome? ), prostitutes or any manual labourers! Actually the first Chinese labourers came to Adelaide from Singapore in the 1840's, however, immigration of Chinese into South Australia was often a way of avoiding the immigration restrictions into the Victorian goldfields. 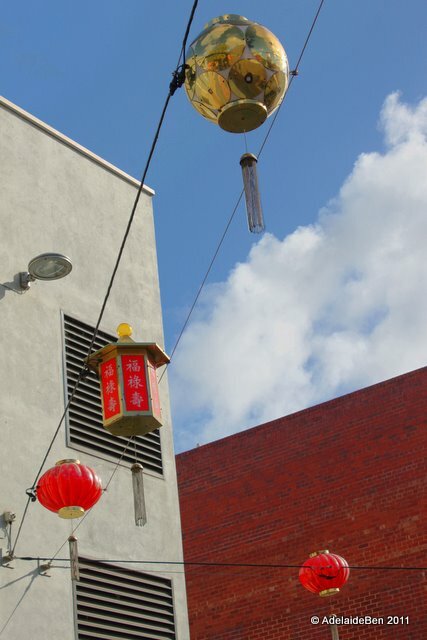 The Chinatown that we now know didn't really evolve until the 1970's and 80's, with the steady influx of Vietnamese migrants and refugees, escaping the war in Vietnam. 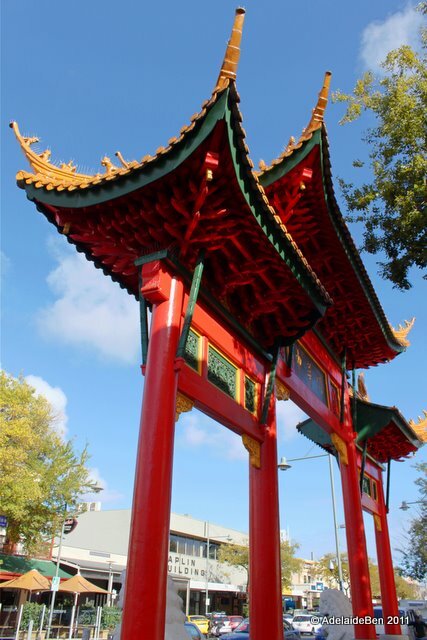 The central element of Chinatown is Moonta Street, perhaps most recognizable for the two Paifang (Chinese-style archways) on both the southern and northern sides, which were donated by the Adelaide Council and Chinese government. And of course, there's other sorts to be found in Chinatown... and we bumped into S-kun at one of the shops... did I mention that they were offering free face-painting to children? Unfortunately, L-kun doesn't like face-painting... so he got an owl painted on his hand. Year of the Tiger was last year, this is Year of the Rabbit... but rabbits don't make for such impressive face-painting. Since then, there's been a slow growth of Asian migration into Adelaide, and a burgeoning of asian shops within the city, which generally cover both asian (and non-asian) vegetables, but particularly asian ingredients from all over. Nowadays, we can get a large number of ingredients from asia - including from Japan. 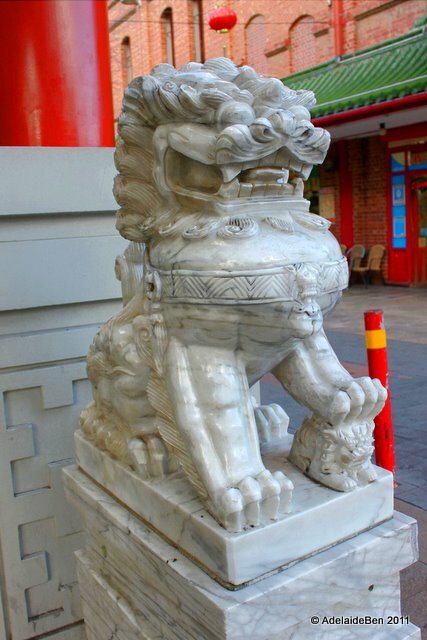 Actually, Chinatown sits at the western end of the Central Market (previous post). There is only one specific Japanese grocery store, known as Little Tokyo, which sits on the eastern side of Central Market (next to the Hilton Hotel). This is a small, but nice, shop that has a good range of Japanese ingredients. If you're Japanese, you might find it hard to pay the mark-up from Japanese prices, but that's the realities of a small Japanese community in Adelaide. You can also find a fair few of these ingredients in the Chinese supermarkets in Chinatown, so shopping around is also recommended. Little Tokyo also has a range of cooking utensils and dishes, plus a small range of other household and arts/crats goods. On a related area, one of the breadshops that we definitely recommend is Breadtop, which is on Grote Street, next to Chinatown. There's lots of asian, including Japanese-style, breads and pastry's here, and they're relatively cheap too. They also do cakes, but we've not purchased any from here. My favourite, melon pan, can also be purchased here... I was introduced to melon pan (a rockmelon flavoured bread) back in my first trip to Japan in 2003, and have been a devoted fan ever since. In case you didn't know, they're the two from the left on the bottom shelf (the cream-coloured ones are the ones I'm familiar with in Japan). They light, yummy, and very convenient when you're grabbing a bite to eat from a combini (convenience store) in Japan. Still, in Japan, there's soooo many yummy and convenient foods available. I definitely recommend checking out both Little Tokyo and BreadTop... and next time your in and around Chinatown, it's good to reflect that Australia up until relatively recently had very strict immigration aimed almost entirely to prevent the sort of multi-culturalism that we enjoy, and indeed cherish today. It's only through such reflection that we can ensure that these sorts of things don't happen again.